Yesterday I received a notification that I have a new follower, Leeece14, whom I actually know via Livejournal, and because she won a giveaway on one of my other blogs. Hi Leece! She also gave me a lovely mug with an orca on it. It has become my favourite mug. 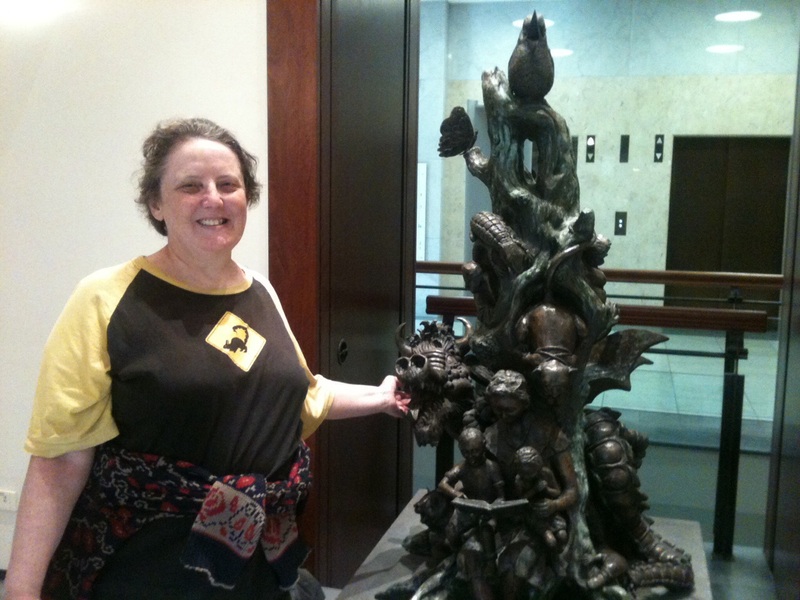 Me in the State Library with the Dromkeen sculpture! The thing is, I haven’t posted here for some time. It was originally intended as a writing-themed site in case my young readers might look for me and find that what I keep up to date is a book review blog. But I find WordPress harder to use than Blogger and simply gave up. And how many blogs can you keep anyway? But I felt guilty and here I am, back again. Even if some of it is a repost of what I have posted elsewhere I will try to get going here again. If you have any questions I can work into a post, do feel free to ask. I have a lot of hits on The Great Raven, but only a few comments and sometimes I wonder who is reading or even whether I’m posting to a empty auditorium. So do comment! I will reply. I’m playing around with turning things into ebooks and, with the help of Sean Wright the Blogonaut, have found a website called Ebook Glue that lets you turn the last twenty-five posts of your blog into an ebook through your feed, for anyone who wants to take your posts away to read on an ebook reader. This one gives you the choice of ePub or mobi. I’ve used it for my other blog,The Great Raven and am now trying it with this one. If you’ve got an ebook reader and would like to read the last several posts of Write On! check out the link below. Enjoy! I answer inquiries for Andromeda Spaceways – both general ones and art inquiries, and also arrange with artists for them to illustrate stories and do our covers. It’s a fascinating job.You get all sorts of inquiries, from oh-so-professional freelancers who inform you that they can spare some time in November to do a cover for your publication to those who have no idea what you do publish because, like some of the writing students, they haven’t checked out the web site except the contact bit, let alone read the magazine. Mostly, of course, we get fabulous artists whose work I look at and think, “Oh, my god, has she checked out our rates? Does she realise how little we can pay her for a LOT of work?” And mostly, they assure me that yes, they’ve checked and the small payment is fine. Those are the ones who love spec fic and think this would be a nice thing to do as long as they don’t have a commission from someone who can actually help them pay their bills. Occasionally they haven’t checked and have to withdraw their submission. Then there are those who have looked at the web site and still don’t seem to get that we publish science fiction, who send a sample that would be fine for an advertising campaign but has no connection with what we publish. I ask them politely if they have something more appropriate and rarely hear from them again. I don’t blame them for trying. You have to check out any market you can when you’re trying to make a living. But a quick look at our web site ought to convince most graphic designers who do advertising that this really isn’t the market for them and save them a disappointing reply from me. To be fair, one young woman who lived in Melbourne and wasn’t actually a science fiction fan, just an artist looking for a market, did take the trouble to go to Collected Works Bookshop, ASIM’s Melbourne over-the-counter outlet and buy up the back issues to study her market. She never got back to me, but she at least had a go. How do I know, apart from the samples (they don’t always send one with their inquiry) that they haven’t checked? Well, there are the ones who send you what’s clearly a standard inquiry, e.g. “As a book publisher, you must…”, “I’ve been impressed by your catalogue of books…” If you’re going to send a standard inquiry, at least don’t try to pretend it’s personalised. When I have to send a group email, I say so, and apologise – and assure the readers that if they’re on my list it’s because I have checked their site and thought it appropriate. I’ve taken to deleting standard inquiries that clearly haven’t checked their market. Thank heaven this is a minority! And thank heaven for the first-class artists who do work with us! Hullo, lovely readers. I know, I’ve already done The Next Big Thing, about my WIP. ebook. the idea is to promote and get some interest in your books. Please check out the links at the end of this post to see what other writers are doing! 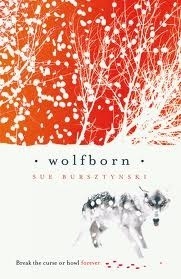 The title of my current book is Wolfborn. It has just arrived in the US. It came from a mediaeval romance by Marie De France, the Lai Le Bisclavret, (Werewolf). I have used the story’s outline but set it in my own world. werewolf knight, Sire Geraint, who is betrayed and stuck in wolf skin. if he was a few years younger. 🙂 I am still casting the other roles. who has been betrayed and stuck in wolfskin, before he becomes a wolf forever! and emailed me to ask if she could have a look at the MS. She bought it two days later. because the story poured out of me. Then I rewrote … and rewrote. Juliet Marillier and Margo Lanagan, all of whom write novels with fairy tale backgrounds. she finds out his secret, making sure he stays a wolf. I thought it fascinating. knighthood. I added a couple of romances and some characters not in the original. Fairies! (Or Faeries) Villains! Love! Adventure! Heroism! The Wild Hunt! And a big, soppy dog. A few months ago, I became very excited because I learned that my novel Wolfborn was FINALLY becoming available in the US. It wasn’t quite what I would have liked – they were going to distribute it themselves instead of creating a new overseas edition – but still, it was available outside Australia and I felt as if the book was being released all over again. I had one gig on the blog Dear Teen Me , arranged by the publicist over there, which I wrote and waited for more to happen, meanwhile arranging the interview and giveaway on I Am A Reader Not A Writer. So I asked the US publicist what else was happening. Her reply came this morning : nothing else is happening, unless I arrange it. She will of course support anything I do, but she’s finished with it. She only has a few review copies left anyway. So,where have the others gone? I haven’t seen a single review from over there. It’s the way of things, I guess. I’ve been dealing with publishers for many years. I can remember when I had to send THEM copies of reviews I found, because they didn’t let me know. One publisher asked me for a publicity photo and then lost it, these being the days before email. Ah, well! Nothing to be done there. I would like to see more sales in the US, and if I had known it would all be over so quickly with so little promo effort from that side of the ocean I would have done more, earlier. So, I would like to invite requests for review copies. If you have a blog and haven’t read my novel and would like to, email me at the contact address on this blog. If you’re in the US I will send your address to the publicist there. If you live elsewhere I will send you a copy from my stash – I bought far too many at author price anyway. I do suggest you check out the sample chapter on The Great Raven to decide if the book would interest you. It’s not compulsory, but it’s sensible. Postage is going to cost me and I would like to think that anyone who asks for it is asking for something that they actually want to read. Just so you know, it is NOT a paranormal romance, it does not feature a Mary Sue who discovers she is a princess and has to marry a gorgeous vampire, mer prince, faerie king, whatever. In fact, it’s seen from the boy’s viewpoint and the romance element is subtle and takes the whole novel to build up, so much so that some reviewers have accused it of being “tacked on”. It’s a mediaeval fantasy with werewolves. I have recently read a glut of fantasy novels and have been re-reading the original classic Lord of the Rings in preparation for the films and it has occurred to me that no one in any of them ever seems to explain how all those elves can be aristocrats. Tolkien, I’m afraid, much as I love him, is the worst offender. All his elves are rulers; we’re never told who they rule. At a literature conference I attended recently, Tamora Pierce, a great Tolkien fan, remarked – not without affection – that no one ever seems to go to the bathroom in Tolkien, but it’s worse than that. We know Bilbo Baggins can cook, from The Hobbit, which may be why he is so welcome in Rivendell, because no one else appears to do any menial work, yet they seem to have no trouble whipping up a feast. The Elves who meet Frodo and Sam early on their quest apologize for their plain fare, but of course, it tastes superb – bread, fruit, wine – as you would expect of Elvish cuisine. We know that Galadriel and her maidens in Lothlorien weave fabulous cloth for magical cloaks, but this, like making magic rings, is an acceptable aristocratic occupation. Somebody makes the lembas (journey bread), I suppose, but we’re not told who – or where the ingredients come from. Come to think of it, who looks after the sheep whose wool is used in elven cloaks or grows the cotton or flax? They do make rope in Lothlorien; when Sam is leaving, he’s told that actually, they would have shown him how if they had known he was into rope-making. But it’s magical rope, of course! Possibly they trade with the communities of Men or hobbits, but this wouldn’t be a very practical way to survive in out-of-the-way Rivendell or Lothlorien – what if you were cut off from your suppliers by war or the Dark Lord or something? In folklore, we are told that the Fair Folk live on illusion. Their palaces only seem to be beautiful, their clothes grand. In fact, they live in holes, their clothes are rags and their food, if you’re silly enough to eat it and be stuck in Faerie, is tasteless. Not only that, but their gold turns into dead leaves overnight. My theory is that the reason for this is because they’re all aristocrats and find it beneath their dignity to cook, clean or make and repair clothes. To be fair, we do see some plebeian Elves in The Hobbit – but this is in Mirkwood, whose Elves are not of the High variety and never went to the West back in the earlier ages. If anyone knows of a serious fantasy novel that presents elves, Faerie, whatever, who actually work for a living – or go to the bathroom – I’d be interested to hear of it. Today’s post is an interview with Tehani Wessely. I have known Tehani since she was with the Andromeda Spaceways publishing co-operative, of which she was a founding member (I came along in the next wave). Whatever she says below about it being an apprenticeship, it was a highly impressive apprenticeship. It is true that she got her practice in publishing there. Tehani, like Miffy Farquharson, whom I interviewed earlier on this blog, is also a judge in a number of book and writing awards. Stuff the comic book superheroes, Tehani Wessely is Superwoman and a nice person on top of it all. SB:You’re a teacher-librarian, a mother, a publisher, an editor, a blogger, a reviewer, a podcaster, a judge for three major awards (the Aurealis, the WA Premier’s and the Children’s Book Council, have I missed anything?) – how do you manage to fit it all in? SB: How did you get the judging gigs you have had? TW: The first time I judged was for the Aurealis Awards. I put my hand up a few years ago when Fantastic Queensland was running the Awards and called for judges, and was made convenor of the Fantasy Novel panel. It’s just grown from there – I’m now the judging co-ordinator for the AAs, and I think my other judging opportunities owe a lot to that experience as well. The first year I did WA Premier’s it was again just a simple matter of applying (and I think they were desperate – I shortlisted two categories on my own!) – I’m about to finish my last year for that, because you can only do three years in a row then have a couple of years break. CBCA was fantastic, and I’m only sad I couldn’t do my two year rotation (the judges are state-based and I moved interstate. I didn’t think it was very fair to the WA members not to have their judge accessible to them!). SB: How many entries did you receive for the Children’s Book Council Awards and how long did it take to read and comment on them? TW: I think we received over 400 entries across four categories. CBCA is great because from about May through to the following March, you receive a box of books every three weeks to read and comment on. The deadlines are nice and firm, and it keeps you on track, so although you’re reading a heck of a lot of books (many of which are picture books or quite short chapter books, which makes it easier! ), it’s spaced out over the year. SB: What criteria did you use in judging the CBCA awards (and any other you might like to comment on)? TW: There are quite extensive criteria for the CBCA awards, which are available on the CBCA website – http://cbca.org.au/userfiles/file/Downloads/Nat%20Site/2011/awards%20criteria.pdf Naturally, literary quality is an important factor in all awards, but so is age appropriateness and many other elements. What’s interesting about judging for different awards is seeing the different focuses, and also how discussions differ in different types of panels – CBCA is eight people, face to face in an intensive four day judging conference in which EVERY ENTRY is looked at again; WA Premier’s is two people for initial shortlisting, then four/five for final decision (face-to-face meeting in an afternoon); Aurealis Awards is completely online, with three to four panelists. You can judge exactly the same books and get very different results – fascinating! SB: What did you do with all those books you received? TW: Most I donate to my local school/s – my own school library does very well out of me, as do my kids’ school. I give some to friends, and keep special ones for myself. I try to be ruthless about what I keep though – we’ve moved around a lot and boxes of books are HEAVY. SB: I’m told that sometimes the difference between a Notable Book in the CBCA awards and a shortlisted one can be one vote – did that happen this year? TW: Each book is shown to the judging team at the conference – if it receives at least half the team’s vote, it’s put forward for discussion to be Notable. The process is very straightforward – a certain number of votes are required for a book to get this honour, and then each of the Notable books is discussed and voted on to work to a shortlist. Then we vote again for Winner and Honour books. Each stage has clearly delineated rules about number of votes needed for a book to make it through. And yes, there were books this happened to – I imagine there would be every year! SB: Would you do any/all of these judging jobs again? TW: In an instant! I really enjoy the process, and the discussions you can have with other judges – I’ve never been in a book club, but I daresay I get the same sort of thing from judging! SB: Tell us about Fablecroft Publishing, the company you founded. TW: I started FableCroft after about eight years working in collaborative groups in Australian small press. Andromeda Spaceways Inflight Magazine was really a kind of apprenticeship for me, and an experience I’ll always treasure for the friendships I made and the lessons I learned. But I eventually decided I really would like to do some projects on my own, and thus FableCroft was born. It’s been ticking along nicely since the first book, Worlds Next Door, came out in 2010. I did two books that year, just one in 2011 (I also helped run a major science fiction convention that year, which ate a lot of time! ), and two already in 2012. The amount of work required for the press comes in fits and spurts, depending on where in the publication schedule I’m at – I’m always looking for marketing opportunities, and do regular newsletters with Twelfth Planet Press, as well as mailouts to retail outlets, update the press’s social networks and am usually working on one project or another at various points of the publication process! Slushreading is perhaps one of the biggest time factors – for Epilogue, which was open internationally, I received almost 200 submissions, which translated to over 900,000 words of fiction. In the first two weeks of the submissions call for the new anthology, One Small Step (closes September 30), I’ve had a dozen stories submitted – it will be interesting to see what the final numbers are like for this book, as it’s open to Australian authors only. I love working on FableCroft – it lets me be creative, and support our local authors. As with Andromeda Spaceways, I really enjoy seeing new(ish) authors I published early in their careers go on to wonderful success, and is one of the reasons I formed the publishing house. It’s also really great when stories I’ve published are recognised at awards time, because it means that other people agree that the stories are as good as I think they are! A FableCroft story won an Aurealis Award for the first time this year, which was very exciting (yay Thoraiya! ), and we also have stories being reprinted in the Ticonderoga Year’s Best collection later this year. Awards are not the reason I publish, but it’s a lovely bonus. SB: Small press publishing seems to be thriving in Australian speculative fiction in recent years. Do you agree – and if so, why do you think this is the case? TW: Personally, I would agree that independent press seems to be thriving in Australia, but I’ve only got a decade long perspective to work with. Certainly it seems in our history, we’ve had other boom periods, but the difference today is, I think, visibility and accessibility. We live in a connected world, and it is both much easier to actually CREATE such things, thanks to the advances and lessening costs of printing/publishing, as well as to be AWARE of them, due to social networking. The noise-to-quality ratio may also be increasing, but authors can certainly find more publishing opportunities now than ever before, and those opportunities seem to be growing too. It means we know more about what is out there, both within Australia and internationally, and can easily find publications we’re interested in reading, and interested in submitting to. It’s a great and scary time to be involved in publishing – so many changes, and so many opportunities. Pretty awesome, really! http://www.fablecroft.com.Fablecroft Publishing. 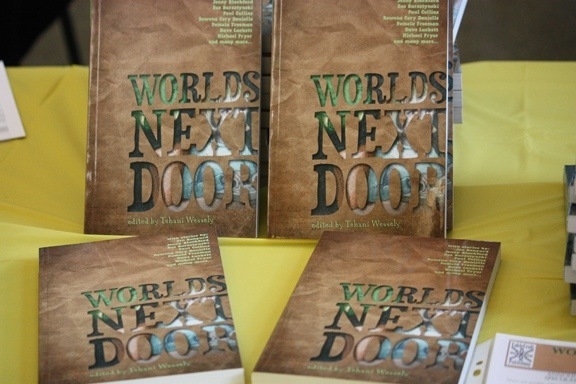 If you’re a teacher or school librarian or both, you might like to check out Worlds Next Door while you’re there. There are some free sample stories to download and some of the stories have been read aloud by the authors.